We just added this page 5/25/05. Jan. 15, 2006 Quran & Nayla had 10 pups. Jan. 2, 2006 Quan & Bea had 10 pups. 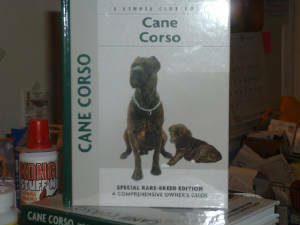 Oct. 20,2005 we just added Then Cane Corso book to our store, by Emaliy Bates US $25.95 / CAN $34.95 plus shipping. Oct. 8, 2005 Storm recieved her TT from the American Temperament Test Society. Apri 2005 - (Harrisburg Classic Rarities Cane Corso Specialty) Quran took 1st place 3 times in his class.